Stoking Innovation in the Magic City: Birmingham’s Creative Industries is an in-depth research study, providing a snapshot of our arts, culture and design communities at a critical stage where investment and stewardship can be a catalyst for continued momentum. As a leader and voice for the creative industries, the Cultural Alliance of Greater Birmingham (as we were then known), with the help of the Creative Birmingham Steering Committee, asked the question: Do you participate in the creative industries? After an exhaustive, but collaborative, process of researching, writing, and rewriting, we’re proud to share our results. 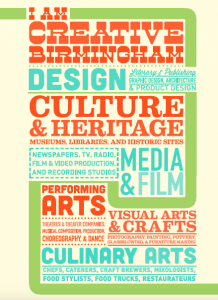 Birmingham has a strong history of supporting arts, culture, and design. We’ve long valued community connections, natural resources, and the unique ways people in our region express themselves through food, music, art, and more. But the creative industries offer even more than great wealth of personal enjoyment and enriching experiences. Creativity creates jobs. Here’s the big news: the study revealed that, in 2013, approximately 23,000 creative workers – 4.68% of Jefferson County’s overall jobs – were generating $558 million in household earnings. And those annual earnings are predicted to grow by more than $5.5 million every year. We are INDUSTRY. Hear us roar! This plan’s eight recommended strategies for growth reach across six creative industry sub-sectors (design, film & media, performing arts, culinary arts, visual arts & crafts, and culture & heritage) to government, education, and the corporate community, as well as other vital industry sectors such as healthcare, technology, and manufacturing. With our wealth of cultural assets, burgeoning entrepreneurial community and talented people, the region is perfectly positioned to support and nurture new creative endeavors and ensure all residents have equal opportunities to realize their full potential. This strategic plan is a living document inspired and influenced by members of the community. Your fresh ideas and continued energy will make it stronger. We hope you will read the report, find where you fit within it, advocate for your sector, and use your talents to make our city even more successful. Or click here to download the Executive Summary of the report. Create Birmingham gratefully acknowledges the Mike & Gillian Goodrich Foundation, the Community Foundation of Greater Birmingham, and the C. Eugene Ireland Foundation for their support of the research and publication of the Creative Industries Report. We are also deeply indebted to the Steering Committee for lending their time and vision to this project.